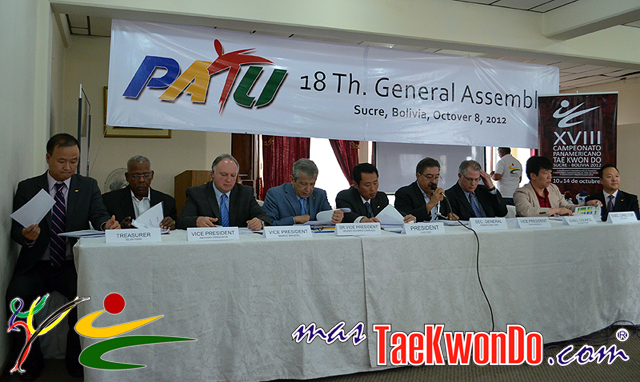 As scheduled the General Assembly of PATU and also the election of the new officers took place. Get all the details here. The Hotel Real Audiencia of the Bolivian city of Sucre, was the venue for the “2012 18th PATU General Assembly”, where after all, the elections to elect the new Executive Council members were held. From the day before there were several meetings that took place, from which the most important one was the Executive Council meeting were apparently everything had already been set, all the different guidelines to follow and as often happens, the General Assembly works just as a formality were actually everything is already previously decided. Ji Ho Choi (PATU President) took the first word on the meeting, highlighting all the great work done throughout his management and all its staff (Executive Council), thanking all the PATU Associations Members, for the trust placed on him during the last four years. The new presidents of the different federations were welcomed, (Ricardo Torres of Argentina, Cristian Gómez of Chile, Raul Pinzón Salamanca of Colombia and Eric Parthen of The United States) and then he asked for a minute of silence for Martin White (International Referee of Venezuela recently deceased). Ji Ho Choi stated that during his 8 year program plan, most of the objectives were achieved and that PATU growth as an organization has been very big, where the main thing was the excellent relationship between all its members, since there were never any fights or problems in any of the meetings. Subsequently the issues on the agenda were addressed, we will detail them in other notes, and then the election of officers proceeded. As we published last week, the fight would be focused much more on the election of the vice presidents of each region than the position for the new presidency of PATU, since there were two presidential candidates to start (Ji Ho Choi and Varo Barragán) but Ji Ho Choi was the only candidate left after Barragán candidacy declination. North America: With only one candidate, the position was left to Simon Su Hwan Chung from Canada. The Caribbean: After the declination of José Cornelio from Aruba, Ferguson Antonhy from Trinidad & Tobago and Francisco Camacho from the Dominican Republic were left. Camacho beat him with 23 votes to 5. Central America: The decision in this case was taken between Wilmar Alvarado from Costa Rica and Frank Silva from Nicaragua. Silva got the vice presidency with 19 votes against 9 from Alvarado. South America: Originally there were three candidates In this region (Ricardo Torres from Argentina, Osvaldo Cáceres from Paraguay and Alejandro Mansilla from Bolivia), but both Torres and Cáceres declined the position and left Mansilla for vice presidency for this region. Afterwards, Choi named Ricardo Torres as PATU Council Member. Throughout the voting, Raúl Pinzón from Colombia was presented as Auditor and Eduardo Labadie from Uruguay as Council Member. There are still available positions in the Executive Committee and there are great chances that three of these places will be taken by Roberto Beltrán Ramonetti from Mexico, David Askinas from the United States and Helder Navarro from Colombia, but this has not been yet confirmed, it is just a personal reading. Something to keep in mind and was explained by the Senior Vice President, Helder Navarro, is that he stated about the different criteria there will be between PATU Statutes and WTF, but this is something that will be seen later in the future and if it is necessary to modify the PATU Statutes then it will done. However, it was interesting to know that the elected officials in the Assembly will hold their position until 2017 and not as the WTF Statutes indicate, that official elections of the Continental Unions should be carried out in the period understood within six months after the elections in the World Federation.